In the end, it will be Barack Obama’s firewall vs. Mitt Romney’s inside straight. My former professor Marc Cooper described the outlook for both candidates in poker terms several weeks ago: on the flop, Obama would have three aces, while Romney would have to draw an inside straight on the turn and the river in order to win. Obama simply has more options. The New York Times calculated 512 conceivable victory scenarios for both candidates. 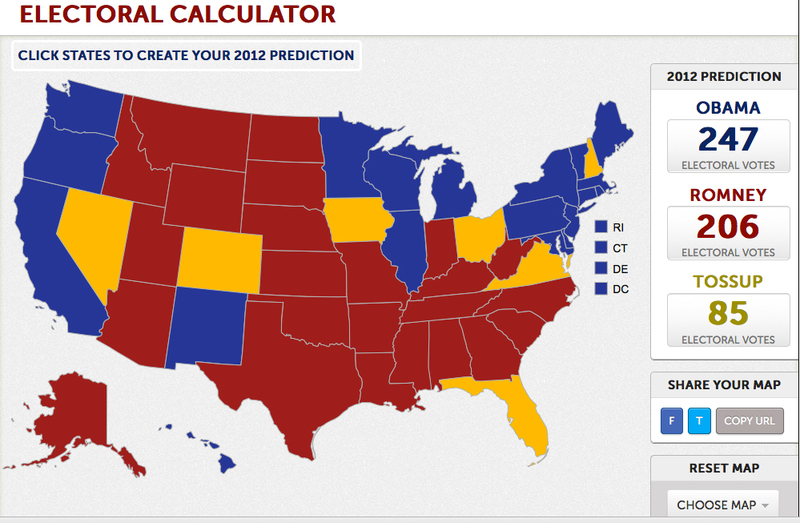 Of these, Obama has 431 ways to win, Romney has 76, and 5 scenarios end up with a tie. If Obama’s Ohio firewall holds and he wins the state, as most polls indicate, that puts him at 265 electoral votes – five shy of reelection. You will hear this again and again during the next 48 hours: no Republican has ever won the White House without carrying Ohio. Despite historical precedent, it is mathematically possible for Romney to win the presidency while losing Ohio, but it will be very difficult. The only way Romney can win in this scenario is if he runs the board and wins every remaining swing state: New Hampshire, Virginia, Iowa, Colorado, AND Nevada. Nevada has been looking increasingly unlikely for Romney, but let’s set that issue aside and look at the Ohio firewall map from a different perspective. If Obama wins Ohio, he only needs one more state – Nevada, Colorado, Iowa or Virginia – and it’s game over for Romney. 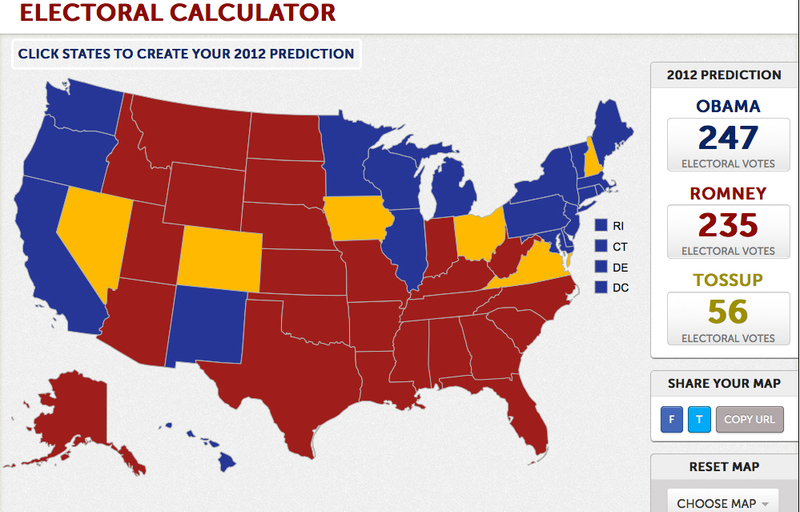 If Obama wins New Hampshire, he comes up just short at 269 and still needs another state. What it comes down to is options. Obama has plenty, Romney doesn’t have enough. Obama reelected 303-235, winning every swing state except Florida and North Carolina and the popular vote by 49-48. Nevada puts Obama over the top once polls close at 10 pm EST. The “Final Prediction” map is the fearless prediction that I put out there 3 weeks ago. It still looks like that is the one that will hold on election day. Although I do think there is a better chance of Obama taking Florida now as opposed to a few weeks ago. So we could be looking at 332 to 206. If Romney loses Florida (possible) and/or North Carolina (a less likely possibility), he’s done.